Deeper understanding. Better business insight. Actionable analytics to make your network operate better, faster and smarter. Do you know what Quality of Experience your users are getting? Can you improve it with more accurate network planning, while reducing operational costs? 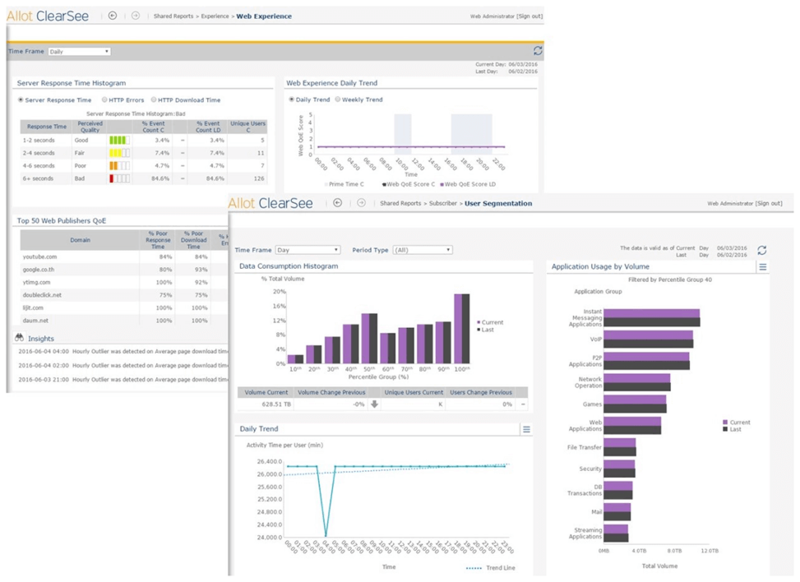 Allot Network Analytics enables you to visualize and understand what it takes to assure optimal application performance for every user. Understanding how smoothly your network is working, what is connecting to it, what applications are running on it, and the resources they’re consuming, is key to optimizing network performance and users’ experience. Accurate analytics gives you the capability to track and measure significant traffic patterns, application performance, and identify nascent problems. This gives you clear insight that informs the management, control, prioritization and security of your network assets and traffic. Allot Network Analytics captures a rich variety of application, user, device, quality of experience (QoE), and security data records, and transforms it into valuable business intelligence that helps you plan and implement actions which ultimately benefit your customers and your business. Allot Network Analytics provide real time and historical analysis that empowers you to make fully informed decisions about your current network management and your future network investments. Real-time network monitoring and usage metrics gives you the most accurate and up-to-date information on network performance and application behavior, and a Self-Service toolkit lets you build your own reports and analyze your data from fresh, customized, perspectives. As a result, analytics can be put to work for the benefit of all parts of your business; from network and operations to marketing and executive management. If you turn the lights on in your network, will you like what you see? Visualize and understand what it takes to assure optimal application performance for every user.